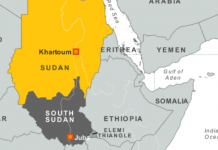 Nairobi (HAN) April 7, 2014 – Warring factions from South Sudan’s ruling elite are in negotiations aimed at finding a long-term solution to a crisis that has displaced almost a million people and killed thousands. Deng, a former cabinet affairs minister in Salva’s government, is now playing a key role in trying to deal with the political disputes that sparked the fighting. Deng’s group wants an interim government headed by an independent politician who would then prepare fresh and credible elections. There must be a new political dispensation that will be able to reconcile our people and chart the future. Deng insists there must be wholesale reform of the governing Sudan People’s Liberation army and Movement. “The crisis that we are facing now originated within the SPLM leadership political bureau over issues of reform, transparency and democracy,” insists Deng. After pressure from regional IGAD leaders meeting in Addis Ababa for the African Union (AU) summit, Salva released seven of the 11 detainees including Deng into Kenyan custody. Now they are in Addis Ababa arguing for an interim government led by neither Salva nor Riek. “There must be a new political dispensation that will be able to reconcile our people and chart the future,” Deng insists. He says this interim government should review the constitution and investigate human rights violations since 15 December, 2013. He refers to an AU commission of inquiry, but there is no agreement yet on its terms of reference and what judicial powers it might have. The former cabinet minister of South Sudan gives a rueful smile and concludes: “Our people have gone though this fighting for a very long time. We don’t think we should take them back to the same misery and the same suffering.” Read the original article on The africareport and the HAN Regional Security Reporters in Addis Ababa. (in Picture) – Standing Six foot ten inches tall, welcoming hand outstretched and softly spoken but with a beaming smile, Deng Alor Kuol does not come across as the coup-plotter type. Yet it was his arrest with 10 others on 16 december 2013 in Juba on this very charge that triggered the implosion of the South Sudan government and weeks of murderous fighting. 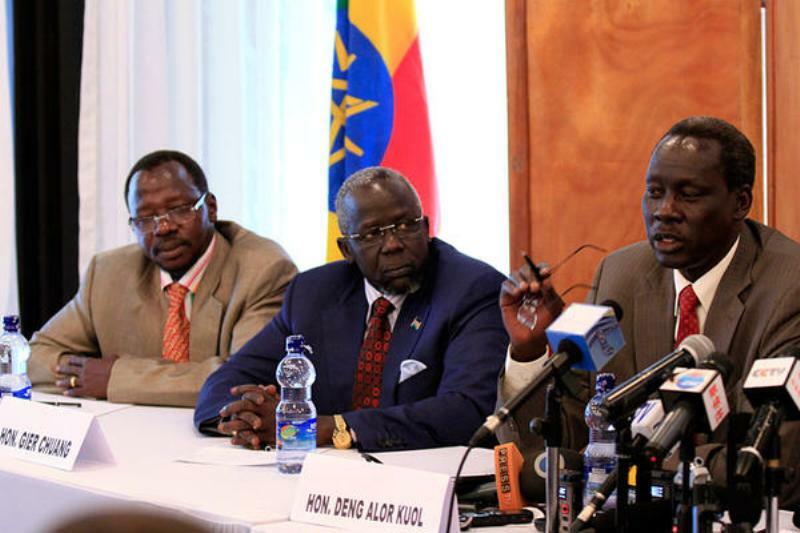 Three of the released political detainees from South Sudan (l.-r.) Cirino Hiteng, former Minister of Youth and Sport, Gier Chuang, and Deng Alor Kuol, former minister of cabinet affairs, address a news conference in Ethiopia’s capital Addis Ababa February 13, 2014.